December 18, 2013 (Tony Cartalucci) - This coming Sunday (December 22, 2013) will be the third and potentially largest mass mobilization yet by the anti-regime movement in Thailand. The counter-color revolution against Wall Street-backed Thaksin Shinawatra and his regime's attempt to transform Thailand into yet another vassal of Western influence has gained immense traction - already forcing the proxy prime minister, dictator Thaksin Shianwatra's sister, Yingluck, to dissolve parliament and call for new elections. Who is Thaksin and Why do People Detest Him? 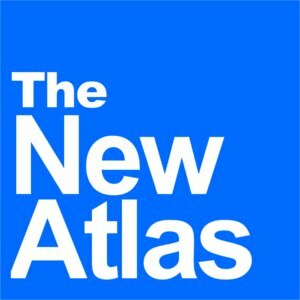 While the Western media, including the BBC and the New York Times would have the world believe anti-regime protesters will be taking to the streets on Sunday December 22, 2013 to stop Thaksin Shinawatra from "lifting the rural poor up and giving them a voice," it is clear that they are instead trying to stop a despotic tyrant from stepping on the poor's back to reach yet more unwarranted power and influence with which to continue his criminal campaign of national theft and mass murder. Considering the very real crimes against humanity carried out by Thaksin Shinawatra and his regime while in office, it is difficult to believe that he would be returned to power, time and time again, even when not eligible for office, nor being on the ballot, nor even being in the country (he has lived in self-imposed exile for years to evade a 2 year jail sentence, 2 arrest warrants, and a long list of pending court cases). Worst of all, it appears that not only are his supporters fully aware of his atrocities, but they have been seen as wildly popular among his support base. 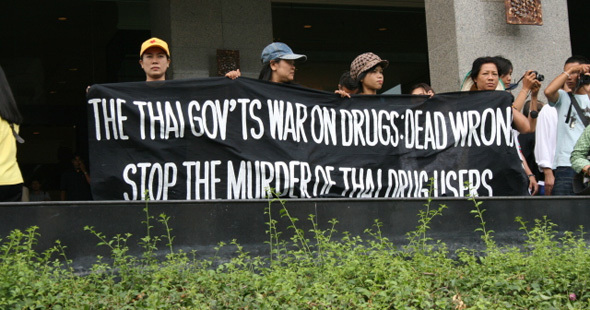 An Economist op-ed titled, "Thailand's drug wars: Back on the offensive," admitted that the policy made Thaksin into a "hero" and that no other policy had "won as many votes" as the 2003 brutal campaign of mass murder carried out under the guise of a "war on drugs." It would appear than, that the electorate voting Thaksin back into power has no grasp or interest in concepts like trials, human rights, or the presumption of innocence until proven guilty. Such dangerous disregard of the rule of law and basic civility by Thaksin's supporters, is just as dangerous as any ruthless despot. It should be clear that maintaining the rule of law and protecting the basic human rights of minorities takes precedent over the lawless demands of a clearly ill-informed majority. 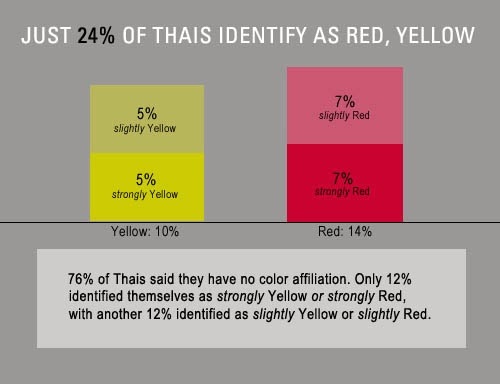 But what's more, is that Thaksin's support base does not even constitute the majority of Thai society - not even close. The Thai Election Commission's final tally of the 2011 general elections indicated that out all eligible voters, only 35% elected Thaksin's Peua Thai Party into power. Out of those that actually bothered to vote, only 48% voted Peua Thai. This betrays the myth of Thaksin Shinawata's overwhelming popularity. 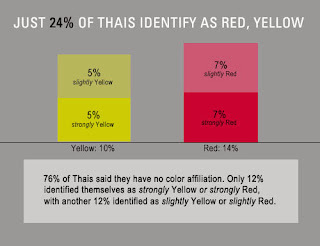 A 2010 Asian Foundation report titled, "Survey Findings Challenge Notion of a Divided Thailand," it was revealed that a mere 7% of Thais identified themselves as "red" Thaksin supporters, with another 7% identifying themselves as merely "leaning toward red." While the rhetoric of the regime and the Western media propping it up would have the world believe that the vast majority of Thai society stands behind Thaksin Shinawatra and his criminal enterprise, it is clear that not even close to half do. Elections bring in more support because of outright vote buying and vote buying schemes like the now catastrophically failing rice buying scheme that is bankrupt and has left rice farmers unpaid since October, and with slashed subsidies since last summer. Thaksin does not have the majority of Thai society behind him. He simply has the most organized, well funded, and most shameless political machine in the nation. While indeed his opponents fair worse in elections, he himself fails to win over the majority of Thais. While he may technical win election after election, he by no means has the sweeping mandate he is portrayed as having. And of course, under no circumstances does he ever have a mandate to trample the basic human rights of anyone, no matter how many people vote for him. Elections are therefore impossible until the loopholes are closed that allow this man and his proxies to continuously return to power. No one in good conscience could call his regime nor the process that returns it endlessly to power "democracy." While a much longer-term program of improving education and economic opportunities for Thais is required, a more immediate solution is to simply uproot the Thaksin regime, and ensure that in the next election, only qualified politicians, disassociated with his many atrocities (or any atrocities for that matter) stand to be elected. Who are the Anti-Regime Protesters and What do They Want? The short answer is - the silent majority. They want the end of the Thaksin regime in all of its different insidious shades. A visit to the rallies will reveal immense diversity, from business owners big (Thai multinationals) and small (noodle and coffee stand owners) to labor unions and organic farmers. The working and middle class constitute by far the vast majority of the movement's numbers, including an influx of disenfranchised farmers who have been cheated and left unpaid by grandiose price fixing schemes that have since 2011's elections fallen into bankruptcy. Their demands are many, but very specific. Unlike pro-regime rallies that repetitively bleat vague demands like "democracy," the anti-regime protesters know what they want and how they plan to get it. 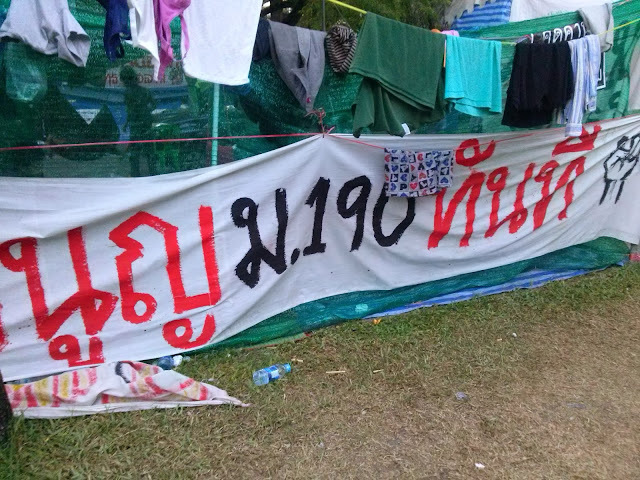 The Western media has attempted to sell a "class struggle" as the context with which to understand the anti-regime protesters - calling them "elitists" who look down on the rural poor that allegedly support Thaksin. 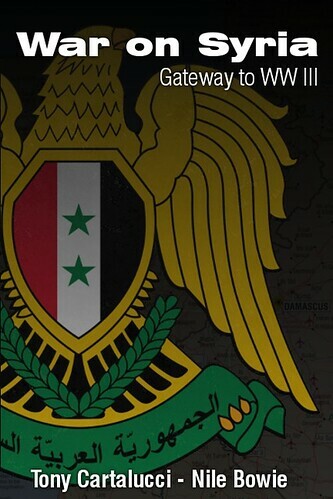 In reality, we can see, this is not true. There are not hundreds of thousands of rich elitists in Thailand that can continuously fill the streets in now two historically large mass mobilizations. The demands of the protesters appear more to center around healthy nationalism rather than pro-big business elitism. Reuters and the New York Times claiming it is the "Occupy Movement in reverse" is utterly false. This narrative is a desperate attempt to undercut the legitimacy of a movement that directly threatens the interests of Wall Street, from which these news organizations are fed their daily talking points. On Sunday December 22, 2013, there will be another mass mobilization, yet again dwarfing anything the regime has ever managed to produce even at the height of its popularity, and this mass mobilization will make attempts by its foes to portray it as "elitist" harder still to peddle to an ever increasingly aware public. We see the mentality of the regime and the insidious foreign interests that support it, and we can imagine what these interests would do with Thailand should they get their way. They have not gotten their way, and it is precisely because the majority does not stand with them. They stand against them. And as long as we continue to stand, we will continue to win. This Sunday, December 22, 2013 - we will stand together.